That does not make a whole lot of sense — since the form is on the web, and an assorted number of people may access it — does each person that accesses the website have to have adobe for it to work? Admin users would need Adobe Acrobat (or compatible app or service) to “create PDF forms” which will be used by the plugin. Web users do not need Adobe Acrobat, other than an Adobe PDF reader to view PDF files. 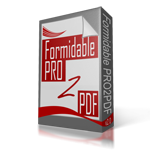 To be clear, our plugin merges data from Formidable Forms to PDF “Forms”, which means you’ll first need to create a PDF Form with Acrobat form fields and upload it to the plugin, then our plugin will fill the PDF form and allow users to receive a PDF with their data by download and/or by email. Let us know if further explanation or clarification is required. We remain at your service.